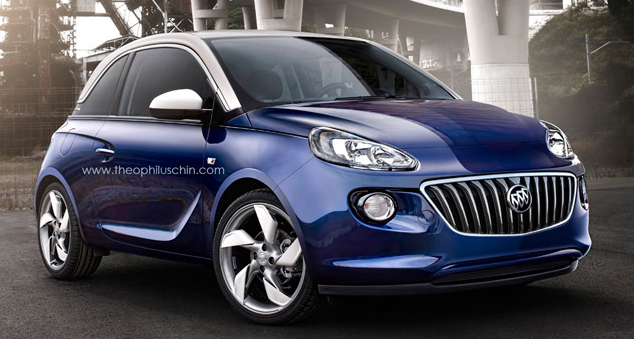 We knew that it was only a matter of time until someone would turn the Opel Adam into a Buick. And to at least someone’s chagrin, that day is upon is! This time, it was none other than ‘automotive manipulator’ Theophilus Chin who replaced Opel‘s chrome-bit grille with Buick‘s trademark waterfall unit. Forget about Quiet Tuning or any other comfortable features that Buick is offering its customers… the grille alone automatically makes this a Buick… right? Looks much better than a Cincento. I wonder if they will do a “T Type” version? If it does, the grille shouldn’t be that low…. do a little bit higher. In North America? Not so much. In China, however? Might not be a bad idea there. Give me!!!! Make it handle and peppy like a MINI Cooper and I’m sold!!! Ok I’ve looked at this a number of times………I have to say. I don’t like it at all. First off its a rendering. The rate GM is going with Buick, it’s unlikely we’ll see this. If it is at some point made into a production vehicle and you don’t like it, don’t buy it. It’s a rendering …………. No chit. If I don’t like it, it’s ok with you if I don’t buy it. Thank you Jesus, Thank you Lord. You’re quite welcome there Mr. 2.4. I prefer Lord Father Death or better yet, Lord Vader!!! Now bow down before me before I force choke you out!!! Seriously though, if this car could do 0-60 in 5.5 seconds, pull at least an 0.87 lateral G, and good steering feedback, it’d be a fun little car. It’d be a ugly little car with that front end. I would hope they’d do a little more with the front end. But at the rate GM is going, we would never see a Buick of this caliber. It’s kinda like the message the forum has been giving lately. RJ — as the error message stated, we were performing some maintenance on the forum technology overnight. Everything is 100% now.